Society has long understood that stability in the home is of paramount importance in the rearing of a child. But what happens when a child’s home life is in turmoil or irreparably shattered? When circumstances or medical issues affect a child’s mental health, and she begins acting out in a desperate plea for love and attention? In the Baltimore area, such troubled youth often end up in the caring homes of foster parents who are associated with the Woodbourne Center. 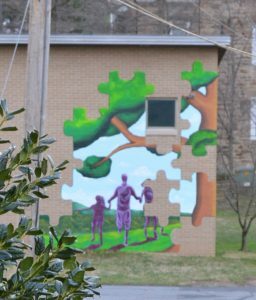 Woodbourne Center provides a wide range of psychiatric services for youth with behavioral and emotional issues. The continuum of care includes treatment foster care for boys and girls, from birth to age 21, psychiatric residential treatment for male youth, ages 12-18, and a specialized school. Woodbourne currently has 75 children in its program – 45 of which (all boys) are in residential care at its Baltimore campus. The 30 remaining children are being housed by concerned foster parents. 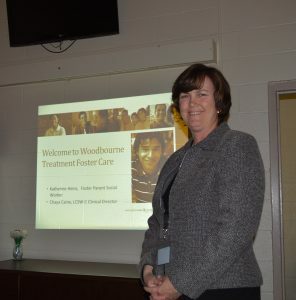 To better understand the programs offered by Woodbourne and the challenges of fostering a child with a mental health diagnosis, we recently attended one of Woodbourne’s informational meetings for prospective foster parents. The meeting was led by Katherine Ziegler Heinz, the Foster Parent Social Worker for Woodbourne Center. Heinz is responsible for the recruitment of new foster families, as well as working with Woodbourne’s current foster parents. Also present were Chaya B. Caine, and four prospective foster parents: Ashley Chambliss, Augin Gray, Joyce B., and Pansie Dean. The additional services may take shape in a number of different ways. Children often arrive at Woodbourne with nothing but the clothes on their back, so government stipends and an in-house Care Program are available to cover the expense of buying pajamas, toiletries, school uniforms, etc. TFC also offers monthly training for foster parents. Heinz said that, once the preliminary requirements have been met, prospective foster parents must complete 24 hours of pre-service training. There are also background checks for anyone in the household over the age of 18. The state requires medicals for all family members, plus they look at the applicants’ driving records. First aid and/or CPR certifications are also part of the qualification process. Once the applicants meet all of the above criteria, Woodbourne undertakes an additional home study. This will include several home visits with all family members living at the residence to assure that everyone is on board with the idea. What does it cost to foster a child? 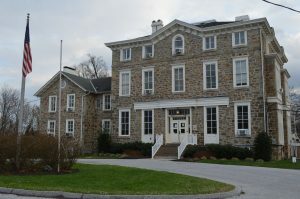 The numbers vary, but given the special circumstances with the children at Woodbourne, TFC offers a higher compensation. “The state-mandated board rate is $833 a month plus an additional $700 for caring for children with emotional issues. An additional stipend may come from the state, depending on the difficulty of care. Funds are also available for activities, such as summer camp, karate, etc. The goal here is to help the fosters maintain a semblance of normalcy. Need more money? Ask the DSS,” said Caine. Heinz noted that clothing kids while in foster care may also become an issue because of the rapid weight gains experienced by children on Psychotropic medications. Again, she reiterated, financial help is available. Financing foster care is clearly a major concern, but several attendees also asked about professional and emotional support? “What makes Woodbourne TFC special is the round the clock support. You can really reach out to us 24/7,” said Heinz. Even so, Woodbourne expects a huge degree of flexibility with its foster parents. Some foster parents have knit together their own support system, either calling on family members or other foster families who will spell the parents now and then or organize group activities. One example offered was a situation where several foster families would gather together every Sunday during football season to enjoy a communal game day. In another case, it’s the foster community coming together to enjoy a yearly banquet. What about vacations? Can foster children travel out of state? Barring a hopeless personality conflict or some kind of a safety issue which would speed the process, the shortest time a foster child would be in a home would normally be 30 days. Foster parents can sign up for two children, though more and more, the state is trying to keep siblings together. That may mean three kids in one foster home or (with a special waiver) four. Having listened to the presentation, we asked the four attendees for their feedback. What drew them to the meeting? And do they think foster parenting is right for them? Ashley Chambliss said she saw the ad for the meeting on Craigslist. Augin Gray, the other newbie in the group, admitted she was on the fence with the idea of becoming a foster parent. Joyce B., who has been a foster mother for over twenty-five years, said in her experience, the difference between the various programs is summed up in the catchphrase “Team Work”. Joyce said she had previously fostered medically fragile babies, “for the longest time”. Her decision on moving over to TFC may rest on what she learns in the next few sessions. Pansie Dean is a 20-year veteran in the world of foster care. Pansie said she took one of her foster children on a trip to Jamaica. As the meeting closed, all seemed to agree on two very important points. 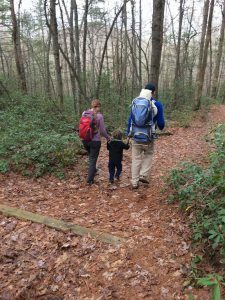 One – foster parenting may be difficult, but it’s an incredibly rewarding experience. The other point is that, for neglected, disabled, and traumatized children, the needs are tangible. Coming up on Sunday, April 23 at 7 PM, Woodbourne will hold its annual Comedy Benefit Night. Hosted by Baltimore Comedy Factory, 100% ticket proceeds go to summer programming for Woodbourne’s youth! Baltimore Comedy Factory is located at 625 O’Donnell Street Baltimore, MD 21224. Visit Woodbourne Center Events for tickets and details.